We have recompiled the much beloved Drawing Tabs MDITabs.ARX application for both 32bit and 64bit versions of AutoCAD 2010. 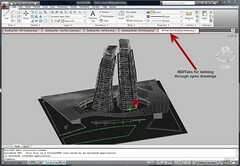 MDITabs allows you to see and quickly navigate open drawings in a series of tabs along the top of the drawing window. To install you simply place the appropriate ARX for your version of AutoCAD 2010 such as 32-bit or 64-bit in your support path. Now use the AutoCAD command APPLOAD to load it, and then add it to your start up suite so it loads each time you start AutoCAD 2010. Please note this tool is unsupported and provided as-is.